Inability to create the .mem file inside the .pvm package (this file is needed to provide swap space to the virtual machine so it could store part of its memory on disk). Incorrect permissions on virtual machine's file. Free disk space being too low. where path-to-VM is a destination to your virtual machine, e.g. /Users/parallels/Documents/Parallels/Windows 7.pvm . In order to paste destination to terminal, please drag&drop virtual machine's *.pvm file into Terminal window. Open 'Disk Utility' on your Mac. Check the available space on you main disk. It should be above 10GB for normal operation. If it is lower, delete the unnecessary files to make sure that the requrement is met. 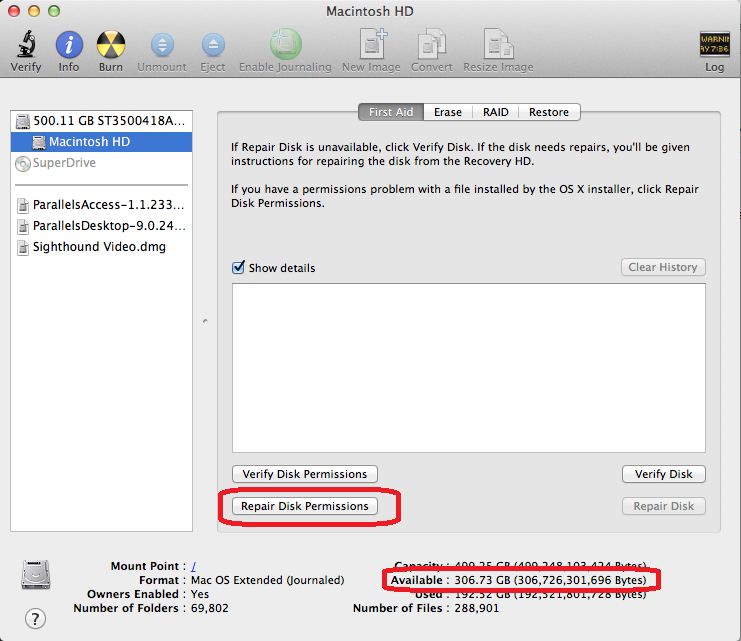 Additionally, to make sure that permissions are not involved, click Repair Disk Permissions as shown above.